Vermont, known as the Green Mountain State, lies at the westernmost edge of New England. 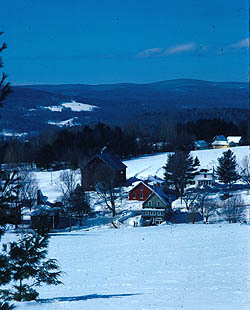 Similar to the other New England States, Vermont’s early settlement patterns were based on physiographic features, watercourses and access to transportation. The physiographic features contained and directed where settlement would easily occur, while the watercourses allowed travel and commerce to occur along their edges and lengths, affording opportunities to establish settlements. Later rail and roads afforded similar opportunities for settlement. The primary physiographic feature in Vermont is the Green Mountains, which run along the western edge of the State in a north/south direction. Due west of the Green Mountains, the Hudson River, Lake George and Lake Champlain act as the physical boundaries between Vermont and the State of New York. Aside from a physical boundary, these watercourses bounding the entire north/south length of the States early on acted as the primary thoroughfares for transportation and commerce activities in the region. The northern, southern and eastern edges of Vermont do not have physical boundaries that separate them from the adjacent States. Other than Lake Champlain, Lake George and the Hudson River, the primary water feature east of the Green Mountains is the Connecticut River, which runs in a north/south direction along the central and eastern edge of the State. Due to its relative remoteness, the physiographic diversity of the State and its slightly different settlement pattern influences (by the French from the North and the English from the Southeast), Vermont was considered wilderness well past the other New England States. During the Colonial settlement period, English settlers migrating from Boston and central Massachusetts were using numerous river corridors, especially the Connecticut River, to access the fertile southeastern lands in Vermont. At the same time, French settlers migrated west along the St. Lawrence Seaway, and south from Canada along Lake Champlain into the northernmost areas of Vermont. The lands of Vermont were originally inhabited by Native Americans of the Abeanki tribe. The Native Americans coexisted with early settlers between 1534-1672 when New France established numerous forts along Lake Champlain. Once European Americans began to flood the region with vigor, numerous land claim battles ensued between nations at first (France and England, France and Iroquois, Canada and U.S.) and later between States (New York and New Hampshire). By the time Vermont received Statehood in 1791, numerous small settlements had been established including Burlington, Essex Junction, Shelburne, Rutland, Woodstock, Montpelier and Jericho. Throughout New England, and especially in Vermont, remnants of glacial retreat in the form of rolling topography and mountainous terrain, deposited thick layers of fertile soil. This rich soil, especially along the many wide river valleys, afforded settlers the ability to sustain themselves through subsistence living. Similar to the other New England States, the colonial period economy was based on furs and skins in the upper area of Vermont, while the southern regions focused on grain and cattle. By the early to middle 1800s the majority of the State economy emphasized dairy cattle and hay. The development of small rural towns along watercourses and major transportation routes typically emphasized a central town green surrounded by important public buildings within the community including schools, churches, agricultural centers, and commercial structures. During the colonial period one of the primary transportation routes was a post road from New York City to Montreal along the Hudson River corridor. Smaller roads that acted as direct access routes into and through the State include routes from Boston heading northwesterly to Brattleboro and from central Massachusetts leading to the Lake Champlain forts. By the mid 1800s three major railroads were in existence leading from Boston to Montreal along Lake Ontario, along the Connecticut River and from central Massachusetts to Lake Champlain. All of these rail lines influenced the development of the State by allowing settlers to more easily move themselves and their products throughout the region. From 1800-1900 Vermont’s population remained a constant 18-45 people per square mile with the State economy relying primarily on dairy cattle and grain production. By the early 1920s two major urban centers, Rutland and Burlington, had been established. Not until the 1960s did the population increase to 25-100 people per square mile, and the economy diversify to include lumber and wood products, metal products, machinery and food processing. People native to the State have long understood what a special place it is. In 1965 two National Forests were established consuming at least a quarter of the State land acreage. Recognizing increasing development pressures and its result in their own and adjoining States, as well as acknowledging increased tourism and its impact to the region, Vermont planners and development officials took a bold step to control growth and retain their heritage. Vermont is one of the few States in the entire country that has very strong planning and development controls in place at the Statewide level. 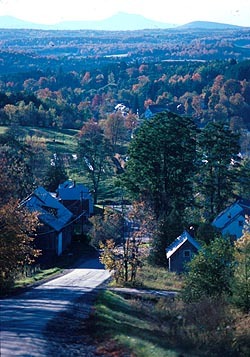 Because of that foresight in the late 1960s and 1970s, Vermont has been able to control urban growth, sprawl and retain its primary rural character in the majority of the State. One example of these controls is signage. No where in Vermont will you find billboards. A closely regulated signage ordinance allows the placement of discreet yet clear signage at all major intersections throughout the state, yet does not allow billboards to be constructed. In addition to signage controls Vermonters have been successful at convincing big business, especially fast food restaurants, to design contextually sensitive new facilities. 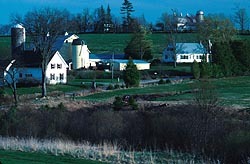 Vermont is still quite rural in character with few concentrated centers of urban development. There is still a thriving agricultural industry as well as a strong tourism industry, even without the billboards.